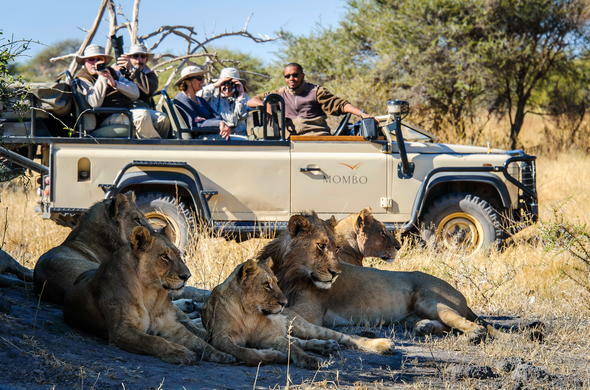 Few safaris in Africa can match the drama of the Botswana wildlife interaction you will experience on this dramatic 4 day Premier Fly-in Moremi Wilderness Safari Package in the Moremi Game Reserve. Includes flights to/from Johannesburg. 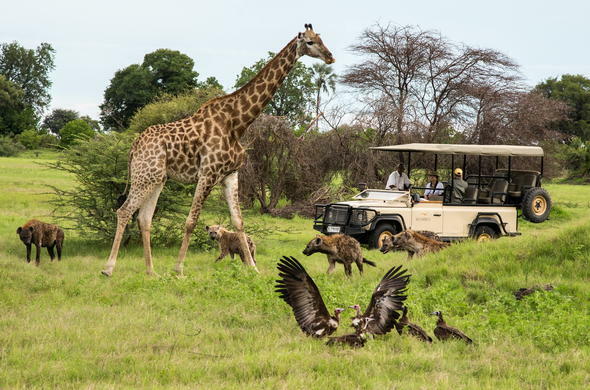 For sheer drama when it comes to wildlife interactions there is surely no better than this Dramatic Wildlife Safari package in what is commonly known as Africa's greatest wildlife destination. 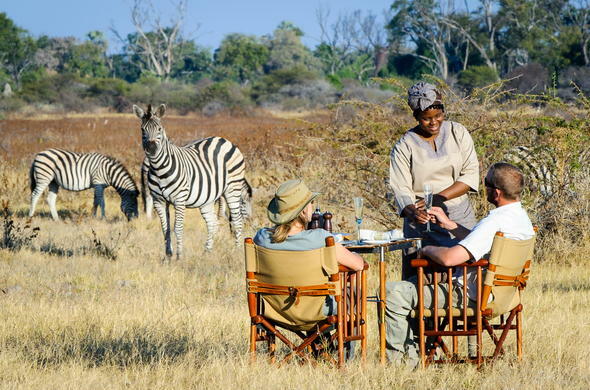 Such is the quality of the game viewing that guests only choose game drives for the activities. The game viewing starts even before the aircraft has touched down on the airstrip and it is not uncommon to see the guides chasing herds of animals off the runway as the plane comes in to land. The short drive from the airstrip to the camp may take a long time due to the sightings en route and once at camp the animal activity in front of the rooms will leave you breathless. Located at the top end of Chief's Island in the Moremi Game Reserve the area is the subject of countless wildlife documentaries and is referred to as the predator capital of the continent. 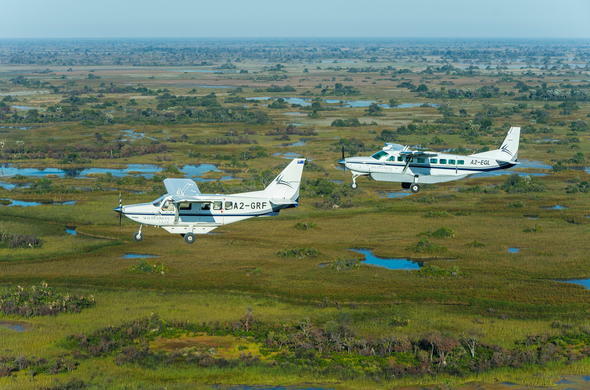 Upon arrival in Maun from Johannesburg you will board a light aircraft and fly over parts of the Delta to your bush camp in the far north-western part of the Moremi Game Reserve where you will be spending 3 nights. The sheer numbers of game that you will see will leave you dumbfounded even before you get to the bush camp from the airstrip. You will be in time for lunch followed by high tea before the afternoon game viewing activity. The days start early with a wake-up call and a light breakfast before heading out to experience this incredible area. The nutrient rich grasses of the floodplains attract countless numbers of herbivores which in turn ensures a healthy predator population. In fact it is quite common to see more predators on a game drive here than other members of the Big Five. With all the animals about it is easy to overlook the stunning natural beauty of the area, which adds to this ultimate African safari vacation. After brunch there will be time to relax during the heat of the day but even this may be disturbed by the many animals that walk past your room. In front of the bush camp there is activity throughout the day adding to the attractions of this safari. The nights are filled with the sounds of activity and one of the highlights of this safari is lying in your bed and listening to the nocturnal interactions of the animals. Another glorious day in the Okavango Delta and your last opportunity to explore. It is the end of your Moremi Wilderness Safari but there will be time for a morning activity and breakfast. Your will be transferred to the airstrip where you'll board the flight to Maun and the onward connection to Johannesburg O.R. Tambo International Airport. This Premier Botswana package is based on a 4 day fly-in safari for 2 guests sharing en-suite accommodation, all inclusive with scheduled flights ex/to Johannesburg O.R. Tambo Airport. It is also possible to combine this Okavango package with a stay in the Linyanti region, Chobe Game Reserve and the Central Kalahari in Botswana.